When you order our overhead crane rope 35×7 non-rotating construction, you get access to plenty of perks associated with its intricate design. A high breaking load combined with anti-corrosion treatment makes each rope in this range particularly hard-wearing. Why Pick an Overhead Crane Rope 35×7 Non-Rotating ? This is just one of the many wire rope products designed for overhead cranes on our site, so what makes it stand out from the crowd? Firstly the configuration of its wires leaves them tightly packed and gives the rope excellent torsional strength, which prevents twisting and fatiguing even when heavy loads are being handled. Secondly the galvanisation of the steel used to make up the rope acts as a barrier to the substances that would usually cause it to corrode. You can specify the length of 35×7 construction non-rotating wire rope you require, as well as choosing between different diameters starting at 28mm and rising to 48mm. We also offer non-rotating wire rope for other crane lifting applications, with an array of construction options and coatings on the table. If you need compacted hoist rope for dockside cranes, we can provide it. If you are looking for rope to kit out a boom crane, this also within our powers to deliver. Our experienced team can tackle any query you might have about 35×7 construction non-rotating wire rope for overhead cranes, or provide competitive quotes when needed. Speak to them via 01384 78004 or by asking your question online. 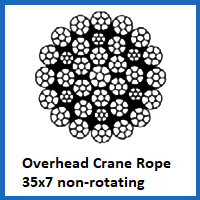 Overhead Crane Rope 35x7 Non-Rotating Overall rating: 5 out of 5 based on 6 reviews.